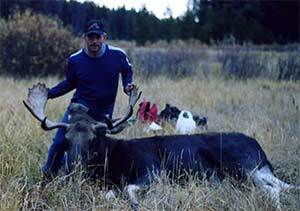 A moose hunt or two is a bucket-list item for me. My research to date tells me that the trophy potential goes up a lot from east to west with the biggest monsters being in Alaska. Accordingly the price of any moose hunt goes up from east to west as well. I live in Wisconsin and would like a 'good' chance at a 47 to 52" class bull. The dilemma comes in with the hunting budget! Am I just as well off driving up to NW Ontario and going hunting possibly 2 seasons to try and get a nice bull at say $2000 per season for a DIY-Outfitted hunt; OR Am I better off head west to Alberta or BC and somewhat blow the bank on one guided hunt at (say at least 6K)? Perhaps an outfitted hunt in a western province would work and save some $$? I am in my early 40s and a few years ago I did an outfitted elk hunt (drop camp). The outfitter came to help with processing my bull when I got it. This type of hunt is right up my alley. I have some DIY skills but am not going to pretend I can go it alone with taking care of a downed moose. I would likely have 1 or 2 hunting companions with me. Thanks in advance, this site is awesome. John... you have posed some interesting questions and options to choose from. I hope I can help you. We have a few contributors from the east that can hopefully shed some light too. As it was recently pointed out to me the All-About-Moose.com website seems slanted more towards BC... or - at least the western provinces. I guess it is because this is the area I know and love. First: I will address the possibility of a DIY hunt in western Canada. If you are a non-resident of Canada (alien), I am sorry to inform you, it is against the regulations for you to do so (in at least three two of the provinces). So as far as I know, the possibility of you and your buddies coming to Western Canada for a DIY non-resident moose hunt is out of the question. In BC a non-resident of Canada (alien) must hunt with a licenced hunting guide from BC or a resident that holds an Accompany to Hunt Permit. The rule for the Accompany to Hunt Permit requires the non-resident to be a relative. This includes close family but not cousins. In Alberta the rules are similar; the non-resident hunter must contract a licenced hunting guide or hunt with a Hunter Host, usually a family member. Unlike the most western provinces of Canada, Ontario does have opportunities for non-resident moose hunts. Updated: Ontario has hunting regulations which require the non-resident of Canada purchase a moose tag through an outfitter or a tourist establishment. You may also qualify to hunt with a direct relative. Thanks to Brad for straightening me out about the hunting regulations in Ontario... I initially misread the regs. Sorry about that! Secondly: I know money is always an issue when pursuing such adventures (unless you are Bill Gates). ;-) I am not a guide nor am I paid any commissions from any. Any recommendations I give are strictly from what I know and the people I have associated my website and hunting activities with. Guided moose hunts are not cheap! Especially those with high success to trophy sized moose ratios. Those types of hunts are in demand and the guides and outfitters know it. High demand pushes the price up! As you previously mention, the further west you go and then turn towards the north, the higher the cost. The biggest of the moose family are of course the Alaskan/Yukon behemoths! To harvest one of these monsters, I would bet is on every moose hunter's wish list. I know my dad and I often say "Just once, we'd love to do a hunt like that! Just once!" DIY hunting is an awesome way to go... when you (we) can do it. As you mention, handling a moose is not usually a solo affair. I have field dressed a mature bull by myself, but getting those big suckers out of the bush requires help, and lots of it if available. I do however; know a couple of moose hunting guides here in BC that offer the type of non-resident moose hunt you are looking for. I have written about a few of them on the Canadian Moose Hunting page. Feel free to contact me for more information. I just wanted to correct one thing. Ontario does not require a guide or relative to take you hunting. There are many unguided hunting opportunities. My brother in law and I have booked a 10 day fly in unguided Moose hunt from an outfitter in NW Ontario for this fall for $1800. Of course we also need to buy the license, food, some supplies etc. But they will fly in twice a week to check in on us. There are lots of other outfitters who provide the same. Ontario Hunting Regulations... see page 44. Good luck with that hunt then! We will be waiting to see pictures and stories upon your return! Good day, just wondering if it is possible to moose hunt in the province with a guide and not have to stay at a camp. Maybe bring a camper, stay on provincial or crown land and obtain a adult non resident tag directly from guide. This may be totaly out of the question, but a few of us were wondering if this is possible. Snoop, I am going to assume you mean the Province of BC. A non-resident of Canada must hunt with and be accompanied by a guide. A non-resident of BC must hunt with and be accompanied by either a guide or a resident of BC who holds an Accompany to Hunt Permit. The rules in BC are different than in, say Ontario, where you can purchase tags from guides. Now that being said, if you are a resident of BC and find a guide who feels he won't sell his guided quota for the season; he may in fact sell a tag. Let me restate the fact this only applies to residents of BC. Otherwise it must be a guided hunt. If you hunt with a guide, I don't suppose it matters where you camp. You may be able to arrange a lower rate if you are self sufficient. I did receive an email from Snoop, he added that he meant Newfoundland, which I see now was the title of his comment! Oops! It seems as though the rules in Newfoundland are very similar to British Columbia. Quote: Non-resident big game hunters are required to be accompanied by licensed guides. A moose hunt can be done in Quebec for about $1,000, 2 tags per Moose. 50% success. Newfoundland has a lot of Moose about $3,500 for a guided hunt. Bumbled on to this website, thought I'd put in my "2 cents worth". My partner and I have been on 11 self-guided fly-in hunts to north central Ontario now-going again fall of 2014. We have to go through an outfitter, stay at one of his remote fly-in cabins. They provide the cabin, propane stove/refridge/lights and all the boat/motors/gas that you need. There is 2-way radio comm w/ base camp, but we have purchased a satellite phone and can call ANYONE w/ that! We have been very successful, averaging over one moose/year. When you sign w/ the outfitter, he has tags ready for you when you get there. Usually one bull and one calf tag for the 2 of us, but we HAVE rec'd a cow and bull tag a couple times and even 2 bull tags 3 times, based on his quota and how many non-resident hunters he had. We hunt along waterways by spot/stalk and sometimes by calling. Most of our bulls have been in the 45-50 inch range, but we have seen some bigger-not common in N Ontario. The work just begins when you kill a big one, but we can get it done in 2-3 hrs now, and nothing eats better! Currently these hunts cost us about $3500 apiece, including the tag. I an American citizen, my father was born in Acton Ontario. If I were to gain my duel citizenship in Canada, could I hunt moose with a non residence lic? I thought that you didn't need a guide below the 54 degrees? I am a guide in NJ, deer bear and geese foul weather outfitter. Thought I could head up to Matagimi and do some waterfowl and moose. New Brunswick has a great moose population. Big bulls are taken every year. So, a non-resident can apply every year for their own tag, and then hire a guide to accompany them or purchase a moose hunt directly from an outfitter. check NB DNR web site for dates to apply etc. How many acres would I need to own as a non-resident living in the lower 48,to get a moose tag and hunt with out a guide?